Motherhood is a a very special thing despite attempts to sentimentalize it, demean it, or glorify it as women’s only purpose–& even if some are epic failures at it. It’s a hard job & special, sacred trust because mothers are entrusted with children & introducing them safely to a scary, complex world. They’re trying to demean motherhood by making it a techno-electronic or rent-a-womb thing, as if one could ever replace human bonds & nurturance between woman & child. Feminism is often accused of being anti-motherhood. On the contrary. What feminism wants is respect for women & children & for the bonds of human love. It would be a lot more impressive that London’s new mayor Sadiq Khan is a Muslim & son of an immigrant Pakistani bus driver if he weren’t also publicly opposed to BDS. Actually, his opposition to BDS makes him very unimpressive indeed since it means he doesn’t understand or is willing to compromise on one of the most urgent issues in world politics today: Israeli apartheid & colonization of Palestine. It means our man doesn’t understand the pernicious role of the US & the UK in the Middle East & is willing to leave the Palestinians completely unarmed before a mighty military machine. Everybody was all excited in the US when Obama became the first Black president. Look how that turned out several wars & thousands of drone bombings later. Clinton supporters push her as the first woman president. We already know where that’s headed, especially in her pledge to destroy BDS & aggravate conflict in the Middle East at the behest of her Israeli benefactors. In the early days of feminism, many thought women leaders would herald the dawn of Aquarius & peace would reign on the planet. But there’s that little matter of Golda Meir, Indira Gandhi, Margaret Thatcher, Madeleine Albright, Condoleeza Rice, Angela Merkel, Christine Lagarde, Hillary Clinton. One’s religion, gender, nationality, ethnicity are of little consequence in political office except for one thing: it means voters are less hateful toward Blacks, women, Muslims. Good. So we should take advantage of that progress & offer voters candidates who are worthy of that respect. Mother’s Day is a time to pay tribute to the tens of thousands of mothers around the world whose children have been disappeared, tortured, murdered for taking an active stand against injustice & oppression. In country after country today, from Mexico to Kashmir, mothers & families of the disappeared organize to provide support to families & demand answers from the oppressive regimes that ripped their children away. Those mothers never go away even after decades as they continue to pressure the regimes for such monstrous crimes. Photographic montages of the disappeared are a universal feature of their resistance which are still displayed decades later of the disappeared under Franco’s regime in Spain, the dictatorship in Argentina, the genocides in Honduras, Guatemala, Sri Lanka. Those photo montages stand as a symbol that the disappeared, through their families, will haunt justice until it is served. 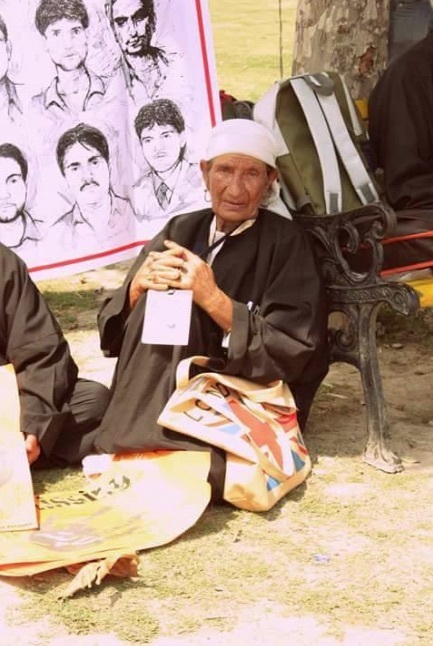 The protester in the top photo is Jana Begum, a Kashmiri mother & activist in the Association of Parents of Disappeared Persons (APDP) in Indian-occupied Kashmir. APDP was founded by Parveena Ahangar after the disappearance of her 17-year-old son, Javaid Ahmad, in 1990. 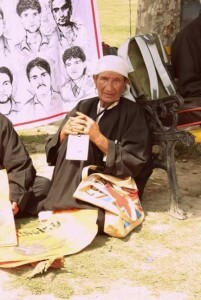 There are an estimated 8 to 10,000 Kashmiris disappeared under the Indian military occupation. The protesters in the bottom photo are mothers & family members of 43 Ayotzinapa students disappeared in September 2014 by the Mexican military. In the past decade, over 22,000 Mexicans have been disappeared by the Mexican military which enforces martial law in the country under the guise of the war on drugs. Our deepest respect to these mothers & activists & our fullest solidarity.